More than 1,160 adults and 340 children joined aquarium staff on Friday, May 25 this year to celebrate the Seaside Aquarium�s 70th anniversary. 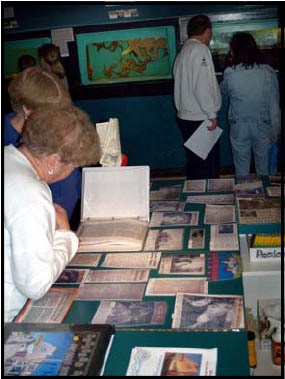 Newspaper articles dating from 1937 through 2007 were laminated and put on display between tanks, at the interpretive center, and among other aquarium memorabilia. In honor of the anniversary, admission fees were rolled back to original 1937 prices - 15 cents for adults, 10 cents for children. Visitors to the aquarium lined up down the block to feed the seals, touch hermit crabs, and watch the octopus swim. In addition, visitors that day were allowed rare entrance to the gray whale enclosure to have their photo taken with the gray whale skeleton. Many also entered a raffle to win a private tour of the back of the aquarium and upstairs apartments with General Manager Keith Chandler. Visitors came from as far as Alaska and New Jersey and were encouraged to leave their memories of the aquarium in years past in a scrapbook. Families who have been visiting since the aquarium opened and families who have just discovered the aquarium in the past few years wrote encouragement and thanks. Celebration of the aquarium�s anniversary will continue throughout the year. If you missed the amazing 1937 admission prices on May 25, consider visiting the aquarium this winter. Between December 1 and 24, the aquarium runs a canned food drive and visitors can gain entrance for two cans of food per person. What to Do and Who to Call Walking along the ocean on a cloudy summer day with your dog and your kids, you notice an odd log ahead on the beach. On further inspection, it is an injured seal. You want to do something to help it, but what should you do? First, call the Seaside Aquarium. 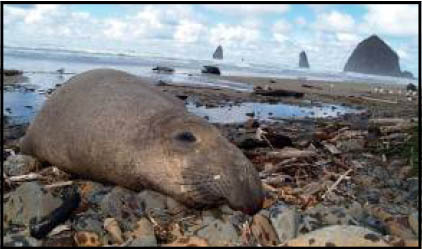 The aquarium heads the North Oregon Coast faction of the Marine Mammal Stranding Network, whose goal is to help educate and keep the public safe. They will come assess the situation and post signs if the animal is alive or determine if it needs to be	removed	from the beach if it is dead. The signs remind the public that the Marine Mammal Protection Act prohibits people from having direct contact with marine mammals and that the best thing to do for the health of the animal is to let nature take its course. Sometimes animals haul up on the beach to rest or to molt. Molting is a process of shedding old fur and skin that causes animals to be incredibly irritable. They look and sound like they may be dying, but they just need some time and privacy and will eventually swim away. Second, stay away from the beached animal. Do not try to feed, touch, or get close to this animal in any way. There are many reasons this is important. First and foremost, marine mammals can transmit diseases to humans and other animals. Some diseases are transmittable by touch. Even seriously injured animals can move rapidly when they feel endangered (and they bite). Also, if it is a baby seal, the mother is probably nearby but will not return while people are around.